To provide coordinated, timely and efficient assessment and referral pathways for young people aged 18 to 25 attending early psychosis and headspace services. Improves clinicians’ confidence and skills in assessing young people for psychosis. Reduces duplication of assessments, which saves time for clinicians and improves the experience for young people. Provides young people with information on what to expect in the assessment period at an early psychosis service. Streamlines the assessment process in early psychosis services when diagnosis is unclear. Standardises recommended assessment tools for young people. Improves communication between healthcare teams. Reduces referral delays, resulting in improved access to treatment and therapy. In 2015, 15% of referrals to early psychosis services in Northern Sydney Local Health District (NSLHD) did not have a clear diagnosis. These young people used 865 clinical hours, which stretched resources and reduced the capacity of clinical teams to provide services to young people experiencing psychosis. In addition, there was no identified suite of assessments or information for young people on what to expect during the extended assessment period. A review of referrals to early psychosis services in NSLHD found there were many missed opportunities for the early detection and referral of psychosis from headspace centres, which are Commonwealth funded ‘one stop shops’ for young people, where they can access a range of mental health and other services. These missed opportunities seemed to be due to a lack of familiarity with and confidence in using the Comprehensive Assessment of At-Risk Mental States (CAARMS) tool used to detect early symptoms of psychosis. There was also a lack of agreed processes for referrals, which may have had an impact on referral rates. As early interventions result in improved recovery and outcomes for young people, early detection and treatment are critical. Prior to the project, there were no formal processes for collaboration between headspace, NSLHD and community mental health services. Each used their own medical records and databases. The lack of communication and knowledge sharing between services resulted in duplication of assessments and significant delays for young people. These delays were partly driven by a lack of understanding of referral processes and services provided. Duplications and delays had a negative impact on young people and wasted the valuable time of mental health clinicians. Anecdotal evidence from clinicians and interviews with five young people about their experience were used to identify the key issues. A referral and assessment pathway was mapped through a consultation process involving representatives from six mental health services. 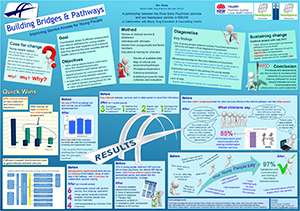 The referral and assessment pathway was implemented, with face-to-face education and training for clinicians who will use the pathway in their service. A suite of assessment tools suitable for young people who undergo an extended assessment process at an early psychosis service was implemented, to clarify diagnosis. An information brochure was developed for young people, to explain the extended assessment process in an early psychosis service. Face-to-face education and training was delivered to clinicians working in the six participating services, on the assessment of young people and the early detection of psychosis, including the use of the CAARMS tool. An interactive and youth-friendly version of the CAARMS tool was developed and incorporated into the clinician workshops. A process of knowledge sharing and joint assessment was implemented, to reduce duplication and delays whenever a young person is referred between services. 90% of clinicians working in the six participating services attended a one-day workshop between June and October 2016, to increase their knowledge and skills in assessments, interventions and referral options. Evaluations of the workshop indicated that all clinicians who completed the training had the knowledge and confidence to use the CAARMS tool and detect early psychosis in young people. 30 copies of the interactive CAARMS tool were printed and distributed between July and October 2016, with 10 copies sent to the six services participating in the project. An extended assessment information sheet for young people was produced and distributed in October 2016. Two thirds of clinicians surveyed across the six services used the recommended screening and assessment tools (DASS 21, PQ16 and CAARMS) in the July to November 2016 period. four young people who experienced shared care across two services. Between June and October 2016, six assessments were shared with another service to avoid duplication, while four joint assessments were undertaken with clinicians from two services. 85% of clinicians surveyed in October 2016 reported good collaboration and information sharing between services. 97% of young people surveyed in October 2016 were satisfied with the communication and information sharing undertaken by participating services. 18 individual patient journeys were mapped and reviewed in October 2016, with information used to identify opportunities for improvement. A significant challenge with this project was the lack of available data. While it was possible to map the pathways of individual young people and identify the delays and duplication, existing records did not capture specific referral numbers between services, or how often specific screening and assessment tools were used. This is something the project team will aim to address in 2017. Early Psychosis Guidelines Writing Group and EPPIC National Support Program. Australian Clinical Guidelines for Early Psychosis. 2nd edition. Melbourne: Orygen, The National Centre of Excellence in Youth Mental Health; 2016. Yung AR, McGorry PD, Phillips LJ et al. Mapping the onset of psychosis: the Comprehensive Assessment of At-Risk Mental States. Australian New Zealand Journal of Psychiatry 2005; 39(11-12); 964-71.